No one can argue with Quinoa. It’s the pinnacle of healthy food with all it’s protein and amino acids. I’m sure you’ve heard lots about it, I won’t go into the nutritional preaching, but I will say – it’s an EASY, forgiving grain. It cooks in 15 minutes – not 45 like some of the other super-healthy grains. I have made these slider burgers several ways, but the recipe below is the one I use when I literally have almost no time to cook. We’re talking super fast action in the morning, while Raquel does laps around the kitchen island. *Or minced dried fruit like apricots or apples, or steamed peas, or whatever you have handy. They’re fine plain too. 1. Rinse quinoa in a metal sieve. 3. Bring to a boil, then simmer with lid on (on low, but still an active bubble or two). After 15 minutes, remove from heat and let it sit in the pot, cover on, absorbing all the extra moisture. 4. Check for doneness – if too hard (it should be bouncy but not crunchy), simmer longer. Add water if it’s completely dry. 5. Add almond butter, hummous, salt, olive oil and tamari and stir until distributed. 6. Take a small handful and squish like it’s a little mud pie, so it sticks together (as pictured). 7. Lay patty in shallow, wide container to cool. Refrigerate (or eat when cool). 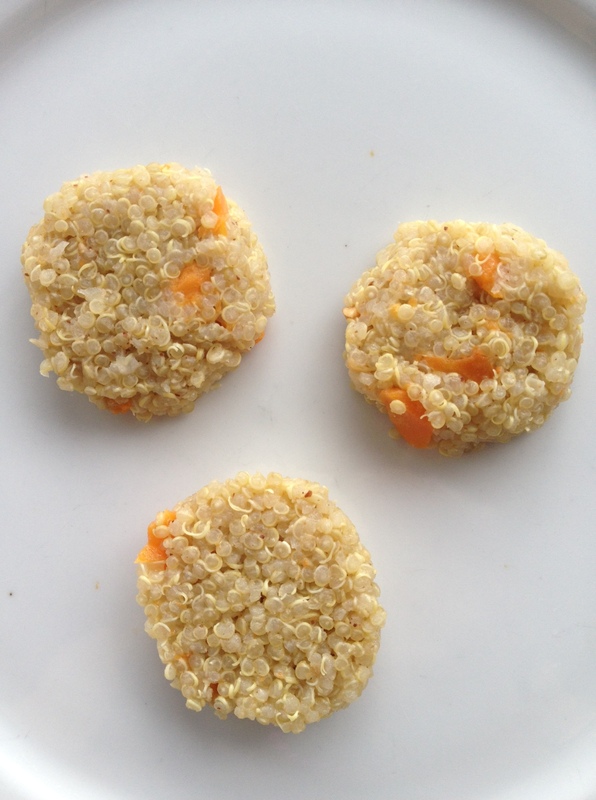 TIPS: If this is your first time making quinoa for your little one and you’re not sure how it will go over, just make a few patties. The rest you can eat yourself (it’s yummy), especially if it doesn’t go over well. You can also bake or fry these if you like, but that’s extra work and extra oil. These patties are crumbly, but even baked and binded with egg, they’ll still be crumbly, just harder. SERVING TIP: Serve with the leftover soft steamed carrots or another vegetable or sliced fruit. Next Article Beyond the blender: The 2 kitchen gadgets I would take to a desert island.